Hot-off-the-press — LODE Has Landed! LODE’s AGX token generation event has completed successfully and the team are now set to unleash their crypographic silver money system on the world. Community developer Zontar has released v1.0 of SYSIO Dapp endpoints! This will enable developers to access a multitude of data on the Syscoin blockchain. During this week’s community developer hangout our friends over at Blocknet demonstrated their innovative toolset for blockchain interoperations: XRouter. Check out the meetup recording below. Blockchain Foundry, a blockchain consultancy formed by Syscoin founder members, has announced it will undergo a significant re-organisation in the coming weeks. 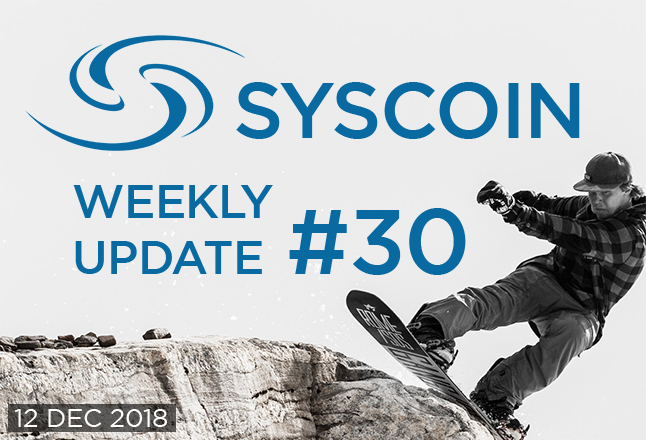 The priority is Syscoin 4.0. More in the next update. The countdown has begun! We’re getting everything polished and ready to migrate to the live server for our December 18th launch. Community Giveaway from Tiribi Tribe!